We are reaching out to landowners because a new opportunity for river restoration work is available to property owners along sections of the Pilchuck River, or the North Fork or South Fork Stillaguamish River. See maps below for details. This program offers a one-time payment in exchange for selling development rights to the riverside land on property. Ownership of the land is retained, and the agricultural and rural uses of the land are protected. There is a funded planting component of this program, which will beautify the property and help stabilize the bed near the river. Fencing is also available. The land is protected in perpetuity from development and provides better habitat for fish and wildlife within and along the river. This opportunity is tied to the National Estuary Program (NEP), which is an Environmental Protection Agency (EPA) place-based program to protect and restore the water quality and ecological integrity of Estuaries of National Significance. Currently, Puget Sound is one of 28 estuaries located along the Atlantic, Gulf, and Pacific coasts and in Puerto Rico designated as an Estuary of National Significance. Each program focuses on the respective estuary and surrounding watershed. We are hoping that 8-10 high-priority parcel owners will consider voluntarily selling a conservation easement on the streamside buffer area of their property for permanent protection. Snohomish Conservation District is collaborating with NOAA, Department of Ecology, Snohomish County and Forterra to develop a model riparian stewardship strategy for priority sub-basins and floodplains in the Stillaguamish and Snohomish watersheds. This effort will integrate assessment work already completed with additional riparian prioritization tools to identify parcel and stream reaches for riparian protection and restoration. Finding creative solutions that enhance Washington’s natural resources and our ability to maintain both economically viable agriculture and healthy fish populations is critical to creating a thriving community. This program seeks to compensate agricultural landowners to restore and protect stream and river buffer areas on their properties with the goals to reduce flood impacts downstream, improve water quality, and improve habitat for fish and wildlife. Call Kristin Marshall, Senior Habitat Specialist, at 425-377-7017 to schedule a meeting or to find out more! Do you live in our proposed restoration area? Please complete our survey to express your interest. Read stories from other landowners who have voluntarily worked with Snohomish Conservation District. The Conservation District selected two high priority areas in which to focus our efforts. 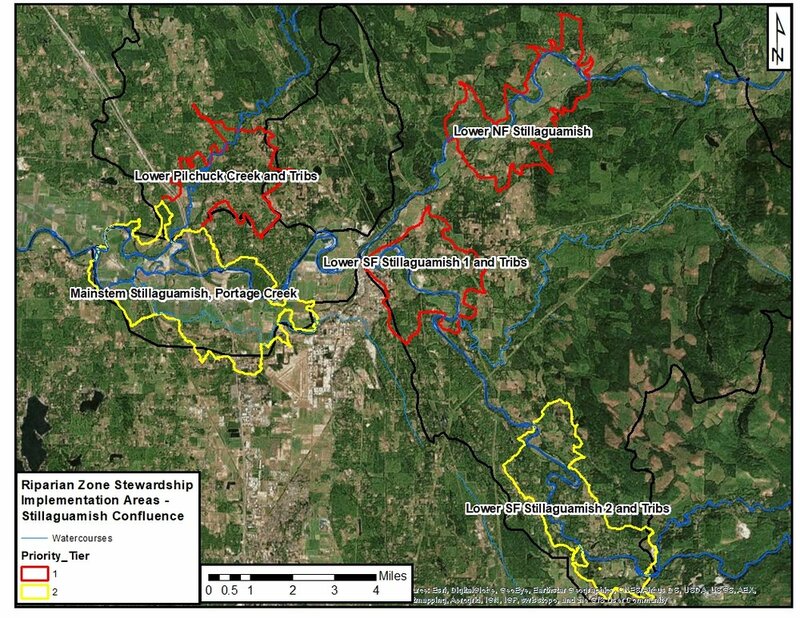 Lower and Middle Pilchuck River and French Creek subbasins in the Snohomish River Watershed. Lower North Fork, Lower South Fork, Upper Mainstem, Jim Creek, and Pilchuck Creek subbasins in the Stillaguamish River watershed. This project has been funded wholly or in part by the United States Environmental Protection Agency under assistance agreement GRANT NUMBER (FAIN): (00189401). The contents of this document do not necessarily reflect the views and policies of the Environmental Protection Agency, nor does the EPA endorse trade names or recommend the use of commercial products mentioned in this document.